When I moved to Las Vegas from Denver in 2003, I had been a stay-at-home mom for only three months. I had no job, no local friends and no life. Taking a shower was the most exciting part of my day in those early days! I was extremely grateful that I had the opportunity to stay home, instead of having to return to work, but lack of sleep (from being up all night with my baby) and no real intellectual stimulation gave me a zoned-out, half-crazy type of personality. I found myself getting lonely. I was unprepared for the intense feelings of isolation I experienced, and the negative impact it had on the friendships with my single, childless friends back in Denver. I would call those girlfriends, wanting to share my days of burping and breastfeeding, while they would want to gush about the newest club opening and their well-deserved hangovers. It was disappointing for both of us – we had trouble knowing how to connect with each other. I realized then that I needed other mothers to connect with, and that I couldn’t take my friendships (or my social life) for granted anymore. I needed to take my new mommy life into my own hands and do something about my loneliness. Babies enjoy the friendships as much as the moms do. That’s when, while searching the web one day, I unearthed the world of online playgroups. I started Googling and found Meetup.com, Yahoo Groups and iVillage.com. I learned that there was an overwhelming amount of parenting playgroups available, from local groups in particular neighborhoods (ie: Summerlin, Henderson or North Las Vegas), to city-wide groups, to types of parenting groups (ie: Attachment Parenting, Christian Parenting), down to groups that have babies born in the same month – of the same year! The moms take turns hosting at each others houses. I jumped in with two feet. I joined as many groups as I could and met lots of other Las Vegas moms who it seemed, like me, were from other places and didn’t know anyone, either. Some of of the playgroups hosted weekly activities; like visiting one of the local parks or taking advantage of the Lied Children’s Museum. Some of the women I immediately connected with, while others not so much. But it didn’t matter. I was just happy to get out of the house and be able to talk about diapers and middle-of-the-night feedings without a second glance from them – because they were dealing with it, too. We mothers exchanged stories and advice and I observed that, even in a city that’s ruled by gambling and adult nightlife, Las Vegas mothers were no different that mothers in other, less exotic places. They wanted the best for their children, they went to church, they hosted park play dates – they were just trying to make it through each day like I was! It was a huge relief to know that I wasn’t alone. 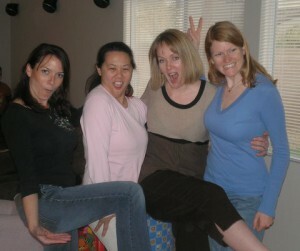 We moms like to have fun, too! Those groups helped mold me into the experienced mother I am today, and the friendships I’ve made within those Las Vegas playgroups will last me a lifetime. Now I get to pay it forward, and tell all the new mothers out there that they’re not alone, and that there’s a enormous community of moms in Las Vegas – just waiting to be found. 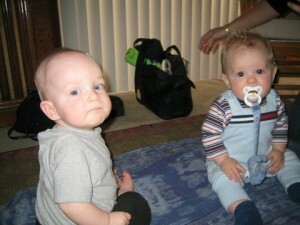 To find an existing playgroup, or to create one of your own, visit Meetup.com or Yahoo Groups. Oh you are so right. I don’t know what I would have done without my daughters playgroup. I recomend every new mom find one. Thanks so much for the resource link! I think we moms can use as many “mom outlets” as we can get, and myworkbutterfly.com is a wonderful site. I appreciate you sharing it! Great article. I still have single friends that I just dont connect with. It has actually torn us apart. My four best friends were from a playgroup I joined when my almost-11 year old was born, although they’ve moved from my hometown we still get together every year and this Thursday I’ll meet up with them! Great story Tasha!! I agree! 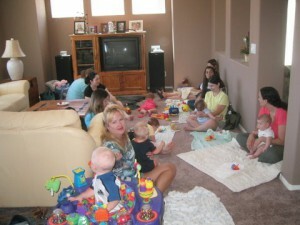 I had never thought of joining a playgroup until about 4 months in to being a stay at home mom. It can be hard spending that much time with an infant with no social outlet! My playgroup was a lifesaver. Thank you so much for this article! You have apparently read my brain directly. I especially appreciate that you gave some websites at the end so we know where to start. The pictures also made me feel right at home. I’m already feeling more connected to this crazy city. Hope you have many more articles from this writer. Hi, I have a beautiful little 13 month old Son, I have been looking for a play group and have had no luck, please help me find a group on the SW side of Vegas, He needs some other children his age to play with. Thank you. Tasha no longer lives in Las Vegas — but she’s still a LLV staff writer, I’ll see if she has any ideas for you. I just sent you an email with a few links to local playgroups. Lots of luck on your search – I’m sure you’ll find a group that you and your son will both enjoy!